Who Must Receive Form 1099-MISC? Form 1099-MISC is given to non-employees such as independent contractors and other entities paid by your company. You must give a 1099-MISC form to any individual or business your business paid $600 or more in a tax year. To Whom Must I Give a 1099-Misc? Services performed by someone who is not your employee (including parts and materials (see box 7). Prizes and awards (see boxes 3 and 7), but not to employees. Other income payments (see box 3). Medical and health care payments (see box 6). Crop insurance proceeds (see box 10). Cash payments for fish (or other aquatic life) you purchase from anyone engaged in the trade or business of catching fish (see box 7). Cash paid from a notional principal contract to an individual, partnership, or estate (see box 3). Payments to an attorney (see below). Any fishing boat proceeds (see box 5). See IRS instructions for Form 1099-MISC for more details. File Form 1099-MISC for each person to whom you have paid...at least $600 in rents, services (including parts and materials)...other income payments... or, generally, the cash paid from a notional principal contract to an individual, partnership, or estate...or gross proceeds of $600, or more paid to an attorney during the year. The IRS continues, "Report on Form 1099-MISC only when payments are made in the course of your trade or business. Personal payments are not reportable." However, the person you paid, and to whom you owe a 1099-MISC does not have to be in business, the individual could be someone who is self-employed or someone who does not file business taxes on a separate business tax form. When in Doubt - Send the 1099-MISC. 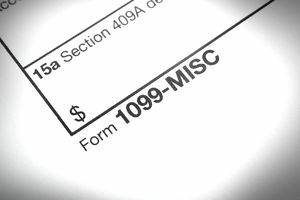 If you aren't sure if a 1099-MISC is required for a specific vendor, complete and send the form. Not sending the form can trigger IRS fines and penalties. Corporations, including LLCs, treated as an S corporation or C corporation, but the exemption from reporting payments made to corporations does not apply to payments for legal services. Payments of rent to rental agents. Payments of wages/salaries to employees and payments for business travel to employees. What About 1099-Misc Forms for Attorneys? Fees: Any law firm or attorney to whom you paid $600 or more in fees during 2018 must be given a 1099-MISC form. Enter the total paid in Box 7. It does not matter if this attorney is a corporation; the 1099-MISC must be provided. Gross proceeds: If you paid an attorney $600 or more in "gross proceeds," you must also provide a 1099-MISC (Box 14). Gross proceeds are an amount an attorney receives as part of work on a settlement or sale (of a business or business assets, for example) or in the case where an attorney accepts funds on behalf of a client and takes a fee from the payment. Before you give anyone a 1099-MISC form, you must first get a W-9 form from that person, verifying the taxpayer ID number. You cannot accept the person's information informally. If your business is audited, you will need to be able to show a W-9 form for everyone who did work for you. The W-9 form must contain a valid tax identification number. The IRS provides instructions for Form 1099-MISC along with a comprehensive list of who should and should not receive a form. Copy B of this form should be submitted to the recipient by January 31, 2019. The due date is extended to February 15, 2019, if you are reporting payments in box 8 or 14. Copy A of this form must be filed with the IRS by January 31, 2019, if you are reporting payments in box 7. Otherwise, Copy A must be filed by February 28, 2019, if you file on paper, or by April 1, 2019, if you file electronically. States may have an equivalent filing requirement or form, so employers should check state tax law for compliance. Check with your tax professional if you have concerns with sending someone a Form 1099-MISC. What Is a Form 1099-MISC for Independent Contractor Income?